I’ve been working on ways to expand Nolan’s snack repertoire that naturally contain some of the nutrients he is lacking, or else are sneaky vehicles for supplements. I’ve already written about some of my success with candies, and of course I always have a big container of homemade graham crackers in the pantry and a bowl of nuts and dried fruit out for nibbling. But Nolan also loves chewy granola bars, and since oats are a low-glycemic source of magnesium, iron, protein and soluble fiber, I did some research about the most nutritious way to embed his gummy vitamins in some snacks. 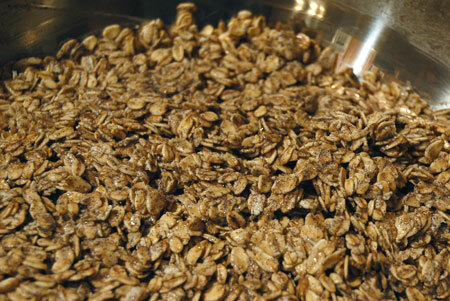 The first step, not surprisingly, is soaking the oats to reduce their phytic acid and free up more iron and magnesium. Oats, however, are very low in phytase, the enzyme that neutralizes phytates, so soaking alone has little effect in this instance; it is consequently important to inoculate the oats with a small amount of phytase-rich whole wheat or buckwheat flour to kickstart the enzymatic process. I used extra-thick rolled oats with buckwheat and whey, and added just enough water to moisten the whole mass; it ended up being a little over a cup of water for three cups of oats. After soaking for 24 hours, I spread them out on parchment in my dehydrator and dried them out while proofing some bread dough for sandwich buns—nothing like multi-tasking! The last step is breaking up the dried clumps, which I was able to do with my hands because of the relatively low moisture and thick oats. This is a project that can, and really should, be done in bulk, although I only had enough oats for one batch of granola this time around. 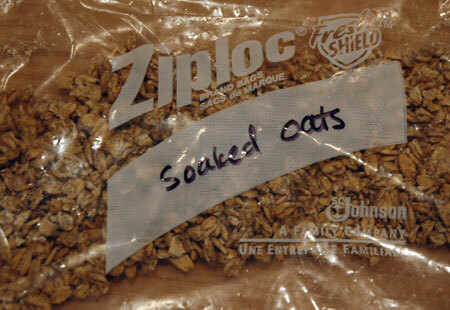 Soaked oats can be used in a pinch for quick-cooking oatmeal or thrown into any number of baking projects. I also intend to prepare quinoa flakes in the same way, probably with the addition of a food processor to break up the clumps at the end. Making the granola itself was just a matter of stirring together the grains, seeds, and nuts I selected, and then tossing them with a syrup made from butter and honey—easy peasy and almost infinitely variable! Substitute coconut oil for the butter, maple or brown rice syrup for the honey; use any combination of grains, nuts, and seeds that you like, preferably soaked and/or sprouted and then dehydrated; and flavor the granola with coconut, cacao nibs, spices, dried fruits, extracts, etc. I think I will be stirring some peanut butter or chocolate hazelnut butter into the honey next time to make peanut butter or gianduja bars, and I’ll post updates here with variants. There are even several baked variants. 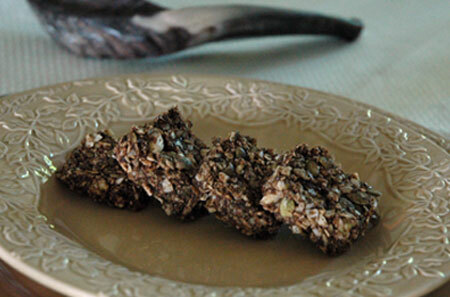 This time around, the one I chose was no-bake, a.k.a. 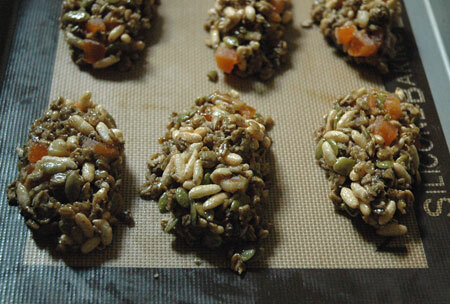 enzyme-friendly, using soaked oats with pumpkinseeds (for zinc! ), puffed brown rice (really just for an alternate texture), and walnuts. Once evenly coated with honey syrup—very much like making rice krispie treats—I packed the mixture into wax-paper lined loaf pans, and made a few freeform bars to incorporate measured doses of Nolan’s omega-3 gummy fishies , snipped into innocuous bits with my kitchen shears. Nolan may not be quite as enthusiastic about these granola bars as he is with his Annie’s bars, but he will be once I find the right combination of flavors! And it is such a relief to find a way to get him used to the taste of his gummy vitamins… although I am still planning to try chocolate-coating some of the “berries,” and try my hand at a few different power-bar recipes, like this one, which is also a candidate for smuggling Nolan’s dietary enzyme into his belly. 1 C add-ins: mini chocolate chips, dried fruit, sunflower seeds, coconut, etc. In a small saucepan, melt butter, honey and vanilla over medium low heat. Once butter is melted and bubbly, cook and stir for 5 minutes, until the frothy bubbles go away and the mixture looks more like soft crack candy; the bubbles will be larger and more controlled. In a separate bowl, stir together the dry ingredients. Mix the syrup with the oats. Incorporate add-ins at this point (remember that chocolate chips melt!). Line a container of any kind with waxed paper. Press bar mixture in with waxed paper, greased hands, or a silicone spatula. Work quickly to pack everything in before the syrup solidifies. Allow to harden up (the refrigerator speeds this up, but isn’t necessary) and then cut into bars. Makes at least 20 bars, equivalent to about 3 boxes processed bars. Update 9/10/11: I gave these bars a try overnight: Blanched almonds, soaked and dehydrated oats and pepitas, chia, and a scoop of chocolate greens powder, they are bound simply with pureed banana and dates. I made two different shapes to indicate the presence or lack of Nolan’s dietary enzyme, and threw them in the dehydrator at night under a bowl of culturing yogurt. In the morning, the yogurt was thick, and the bars were firm; Nolan snacked on one as part of his breakfast, and seemed to like them.